"How to be a giver, not a taker." "Give and it will be given to you, good measure, pressed down, shaken together (like shaking the cereal box so it can be filled to the very top), running over, will be put into your lap, for the measure you give will be the measure you get back, and still more will be given you." This page will highlight kids who take on a 4 week project during the summer of being a big brother or big sister to a younger player. These are high school players who practice with younger kids. A payment of $10 for an hour workout is paid to Jim, and in turn, is paid to the high school player. Why be a member of this club? It has been said that if we try to keep it (our talents, money, energy, reputation) all to ourself, it will all own us and we will be a slave to our own selfish needs. We need to free ourselves to love and serve our neighbor or friends (younger tennis players). If we fail in this, we never truly enjoy life. How it got started: In the summer of 2006 many of the high school players in the three team photos below helped coach kids from the younger age groups. It brought great satisfaction to the helpers, and the younger kids improved faster. Thanks to one and all. Most of these players are now in college or seniors in high school. Requirements: You must be approved by Jim as a role model, a person of strong character, reliable, friendly and interested in serving the needs of kids younger than you. Olivia and Sammi teamed together to win 2nd place in our doubles tournament. Younger kids look up to older kids and need role models who have a big heart. So we have set up a chance for you to get on this elite team of players who give of your time once or twice a week for 8 weeks to play tennis for 1 hr with a less developed player, and get to know the younger player by spending another 1/2 hour listening to them and sharing your own experiences. This will be a huge motivational time for the younger child and may even change your own life. It will tell the younger player (s)he is appreciated and important to someone outside his or her immediate family. 1) Tell Jim you want to be on the "Pass it Forward Team". He will tell you if you qualify. 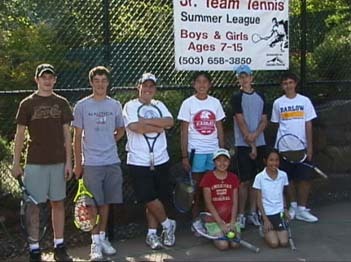 2) Jim will let you know if there is a young player who wants a tennis friend to practice with. parents must be present at the tennis court at a local high school during the hour and a 1/2. areas of their tennis game. Next, help them on their serve or volleys. Finally, play out some points with them, but don't keep score unless they insist. questions with 3 to 4 words. Don't let them get away with that type of answer. Ask the famous 5 Conversation Expander Questions: What, Why, Where, When & How. "What do you like about it? Why is it your favorite? When did you first get interested in it? How do you think it will benefit you in the future? In other words, help them expand their answer. at it you will come out of your own shell and become much more people centered instead of self centered. do this. She is an expert conversationalist, much better than me. However, I am still learning to improve. In the end, if you do this, you will gain a new friend who needs a role model like you to look up to. BONUS: Someday when you apply for a job this can go on your resume, i.e., that you were a member of Big Brother/Sister Club. Future employers are impressed with new people who are applying for a job & think and act outside the box, i.e., outside of self & onto others.